It has been an interesting year for the stock market. The S&P 500 is up 16% over the last year. And that’s after it was up better than 30% in the previous 12 months. So, some remedial math will tell you stocks are up 46% over the last two years. Needless to say, that’s a huge move for stocks over the last two years. The rally over the last 12 months came up a little shy of the 17.7% average. But a 16% gain is still a very strong move to the upside for US stocks. What’s more, the stars are aligning for a Santa Claus rally to finish the year. The oil market freefall has stopped and the Fed said they would be ‘patient’ with raising interest rates. The two things I believe were needed for the Santa Claus rally to make its usual appearance. It’s not as if anything has changed. It’s more of the same thing we have seen this year. Investors become fearful and sold… then they realize they sold for no good reason and quickly flood back into stocks. A quick look at the sector performance relative to the S&P 500 performance over the last 12 months reveals the true strength and weakness of the market. As you can see, energy has been a huge drag on the performance of the S&P 500. It has underperformed the S&P 500 by 21.4% this year. It’s the only sector that’s actually down over the last 12 months. It offers some real value if you are inclined to look for bargains. 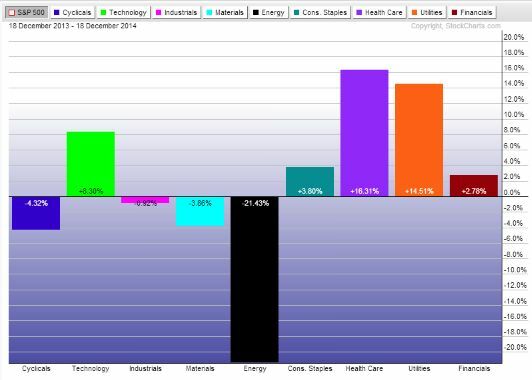 On the other hand, healthcare has been the best performing sector over the last 12 months. It was up 20% over the last year and outperformed the S&P 500 by 16.3%. Where will the market be next year? I wouldn’t be surprised to see the market fall into the same pattern as last year. I expect to see some profit taking in January followed by another surge higher in the spring. The sectors that look to be in the best position to outperform are consumer related sectors that should get the biggest benefit from cheaper oil prices. But we could also see a nice rebound in energy stocks as long as oil prices stabilize. Don’t forget that many oil and gas stocks are still very profitable even with oil prices around $70 per barrel. By this time next year, I’m forecasting another 18% gain for the S&P 500 led by a rebound in energy stocks and a strong year for consumer stocks.